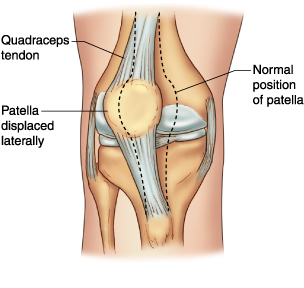 A subluxation or dislocation of the knee cap (patella) commonly occurs during deceleration. The knee cap slides partially out of the groove that is designed for it but does not limit mobility. Pain and swelling may accompany this condition. Athletes who have a muscle imbalance or a structural deformity, such as a high knee cap, have a higher chance of a subluxing knee cap. The patella is a small triangular sesamoid bone within the tedon of the quariceps femoris muscle and forms the front of the knee joint. It is attached above to the quadriceps tendon, and below to the patellar (tendon) ligament, and articulates with the patellofemoral groove between the femoral condyles to form the patellofemoral joint. The patella slides over the groove when the knee flexes. If the outer muscle of the quadriceps, the vastus lateralis, is stronger than the inner muscle, the vastus medialis, this imbalance may cause an uneven pull on the knee cap forcing it out of the normal groove. In addition, the lateral femoral condyle and medial patellar bone may be bruised. This happens with forceful contractions such as planting, changing direction, or landing from a jump. Strength imbalance between the outer quadriceps group and the inner group. Impact to the side of the knee cap. Twisting of the knee. Feeling of pressure under the knee cap. Pain and swelling behind the knee cap. Pain when bending or straightening the knee. Continued subluxations can cause small fractures in the patella, cartilage tears, and stress on the tendons. Failure to treat a subluxation could lead to chronic subluxations. During rehabilitation, activities that do not aggravate the injury should be sought, such as swimming or biking instead of running. Strengthening of the vastus medialis and stretching the vastus medialis will help correct the muscle imbalance that may cause this condition. A brace to hold the knee cap in place may be needed when initially returning to activity. To prevent subluxations, it is important to keep the muscles surrounding the knee strong and flexible and avoid impact to the knee cap. Subluxations respond well to rest, rehabilitation, and anti-inflammatory measures. Rarely surgery may be required to prevent recurring subluxations due to misalignment or loose support structures. Call (+65) 6471 2674 Now to make an appointment to treat your subluxing knee cap today.